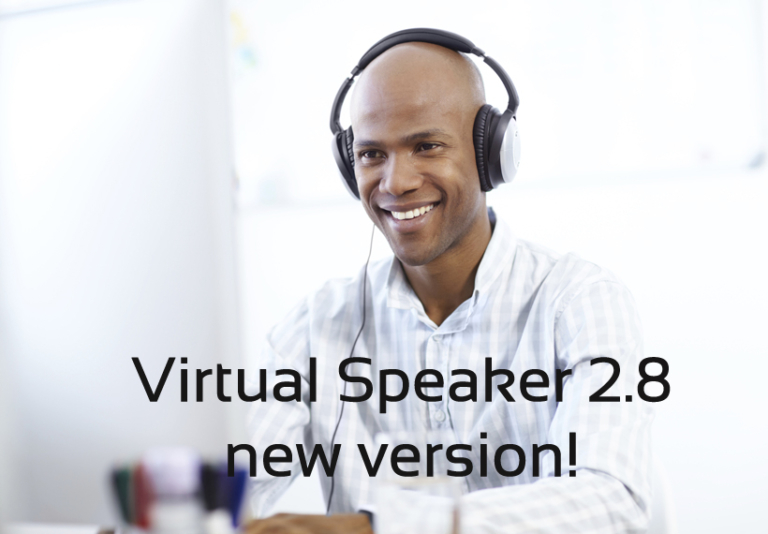 Virtual Speaker 2.8 features 19 additional voices, a new graphical interface and an exclusive set of features. Virtual Speaker has been designed for companies that need to produce voice files easily, offering a desktop solution 24/7. Virtual Speaker doesn’t require any special technical knowledge or hardware investment and it instantly converts any text into a pleasant audio result using the language, the voice and the output file format that suit your needs. 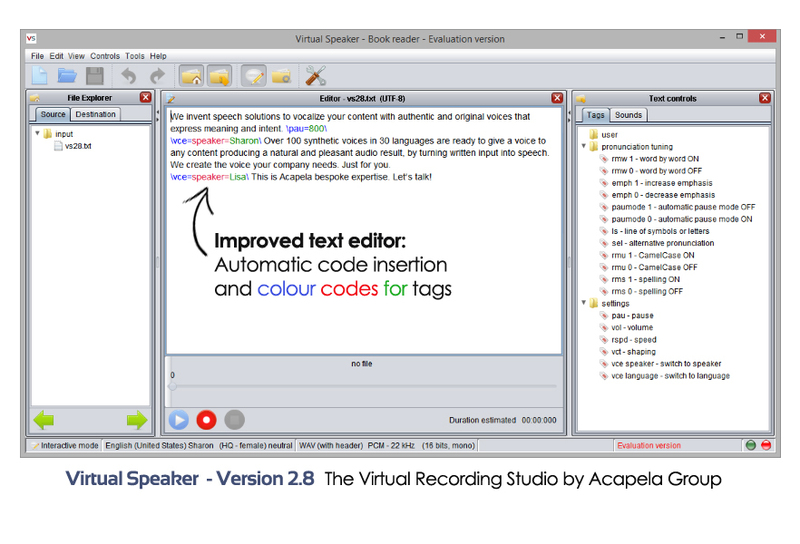 The latest version, Virtual Speaker 2.8, provides an enhanced, intuitive interface which allows you to seamlessly add tags and sounds, switch voices or languages and select the most suitable vocalization of a word with reference to the context, from a set of alternative pronunciations. Automatic insertion of control codes makes it easy to fine tune the text, and the syntax coloring feature makes these codes easy to spot when reviewing your work. Sharon and Manon, Acapela’s brand new US English and French voices, are included in the voices on offer. Based on improved methods and optimized linguistic processes, they are part of a new wave of Acapela voices that are extremely pleasant to hear and even more natural, fluid and intelligible. Virtual Speaker is used whenever voice files are needed – starting from 5 hours pack to intensive needs – providing a voice for eLearning, authoring, customer relation services, public announcements or brand management. The new Graphical Interface provides easier and quicker access to the most commonly used controls. replace, different colors for tags, the possibility to change font size and highlight text currently being read. 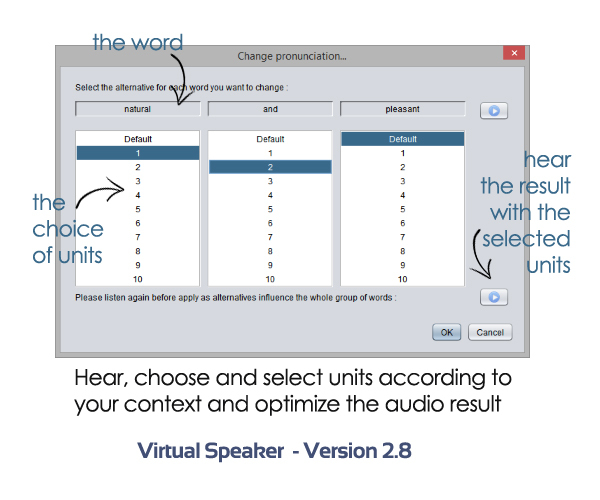 The contextual menu facilitates the most common functions related to words, such as connection to the Pronunciation Editor and the Pronunciation Change feature. The fine tuning process has been enhanced and now provides the possibility to select an alternative reading of the same portion of text, through a user friendly visual interface. All your project settings are displayed in a single window.